NEW ORLEANS – The indoor track & field season had to heat up before it slowed down. We saw some fast times and incredible debuts this past weekend across the nation before teams take a break for the holidays. 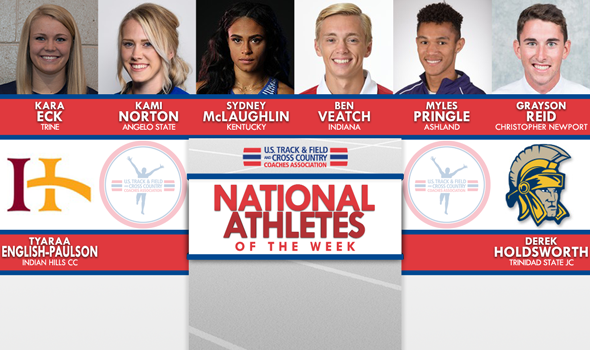 Here are those athletes who stood out among their peers and were named the National Athletes of the Week by the U.S. Track & Field and Cross Country Coaches Association (USTFCCCA) on Tuesday. Ben Veatch opened his redshirt freshman season in a big way. Veatch cruised to a victory in the 5000 at the Hoosier Open when he crossed the finish line in 13:57.27 and broke the USATF American junior indoor record. It should be mentioned, however, that Stanford’s Chris Derrick recorded a superior time of 13:48.26 in 2009 as a junior athlete, but that performance was never ratified as a record. It was a three-second win for Veatch over Portland’s Jeff Thies, who finished 14th at the 2017 NCAA Division I Cross Country Championships last month. Veatch and Thies were two of six men who went sub-14:10 in the race. Sydney McLaughlin made history in her collegiate debut this past weekend. McLaughlin, a freshman at Kentucky, clocked a blistering time of 36.12 in the 300 at the Hoosier Open. That was the American junior record, the second fastest time in American history, second fastest in collegiate indoor history and seventh fastest in world history. Historic and McLaughlin go in the same sentence quite a bit. Just last year, McLaughlin became the youngest athlete to make the U.S. Olympic Track & Field team since Carol Lewis and Denean Howard qualified for the 1980 Moscow Olympic Games, which the Americans boycotted. The next time McLaughlin will take the track is in mid-January at the Kentucky Invitational, Clemson Invitational or New Mexico Cherry and Silver Invitational. Only two men in NCAA Division II right now have two automatic qualifying marks: Grant Colligan and Myles Pringle. But only Pringle leads the nation in both of his events. This past weekend at the Kent State Golden Flash Gala, Pringle surged into the national lead with a time of 47.00 in the 400. Pringle won the event title by nearly three seconds. Just last week Pringle found his way into the national lead in the high jump at 2.15m (7-0½). Kami Norton showed why she is one of the best combined-event athletes in NCAA Division II this past weekend at the Boo Rogers Combined Events. Norton automatically qualified in the pentathlon with her score of 3999 and added three other provisional marks in the 60 hurdles, high jump and long jump. She doesn’t have much further to go if she wants to set a PR in the heptathlon. Last year at the NCAA Division II Indoor Track & Field Championships, Norton hit a career best when she totaled 4067 points in a runner-up finish to Pittsburg State’s Emily Dearman. Grayson Reid’s breakout year continues. This past weekend, Reid PR’d in both the 3000 and 5000 in winning efforts at the CNU Holiday Open. Reid climbed atop the NCAA Division III leaderboard in each event. In the 3000, Reid clocked a time of 8:25.50. That broke his previous PR by nearly eight seconds. Then in the 5000, Reid set an absolute PR (indoor and outdoor) with his time of 14:17.49. That time would have won him the individual title indoors last year at NCAAs. Kara Eck PR’d in the weight throw in a big way this past weekend. Eck launched the implement 18.45m (60-6½) at the Oiler Opener and finished runner-up to Erica King of Kroger. Before this past weekend, Eck had never breached the 18-meter barrier. Last year at the NCAA Division III Indoor Track & Field Championships, Eck finished seventh behind four seniors and two juniors. This year Eck is a senior and ready to drastically improve her placing. Derek Holdsworth went up against one of the best NCAA Division II had to offer this past weekend at the Adams State Early Grizzly Open. Holdsworth raced the NCAA DII outdoor 800-meter runner-up Derek Holdsworth and not only beat him, but set a facility record with his time of 1:52.31. That time converts to a 1:49.2 when you factor in altitude and track size. One day earlier Holdsworth ran the 1200-meter leg as a member of Trinidad State JC’s DMR team and helped them to an NJCAA-leading mark. Tyarra English-Paulson is one of two women who have punched automatic qualifying marks for the 2017 NJCAA Division I Indoor Track & Field Championships. The other, Macy Gustavus, was named National Athlete of the Week last week. English-Paulson clocked a time of 1:40.84 in the 600 to win the event title at the Dutch Holiday Preview. She also holds the NJCAA lead in the 60.